The herb called dwarf elder (Sambucus ebulus) saves people from cancer. It is a shrub that can be found along the riverbanks. This herb grows in August and September. It is also known as dane weed, danewort, danesblood, European dwarf elder, walewort and elderwort. The fruits of this shrub are collected only if they are ripe, because only then they have healing properties. From the leaves can be prepared tea and from the ripe fruit jam can be prepared, that can improve the appetite. The root, which is fleshy and white, has a nauseous, bitter taste. Its decoction is a drastic purgative and it cures the bites of mad dogs and adders. Juice from the root is used to dye hair black, in some parts of the world, and a blue dye and ink may be obtained from the berries. Phytochemical composition differs in the different parts and extracts of the plant. The commonly known phytochemical compounds from this plant are: steroids, flavonoids, tannins, glycosides, caffeic acid derivatives, cardiac glycosides, ebulitins, ebulin 1 and volatile substances. Traces of a cyanogenic glucoside, sambunigrin and the triterpenes alpha- and beta-amyrin were isolated from roots, leaves and fruits. 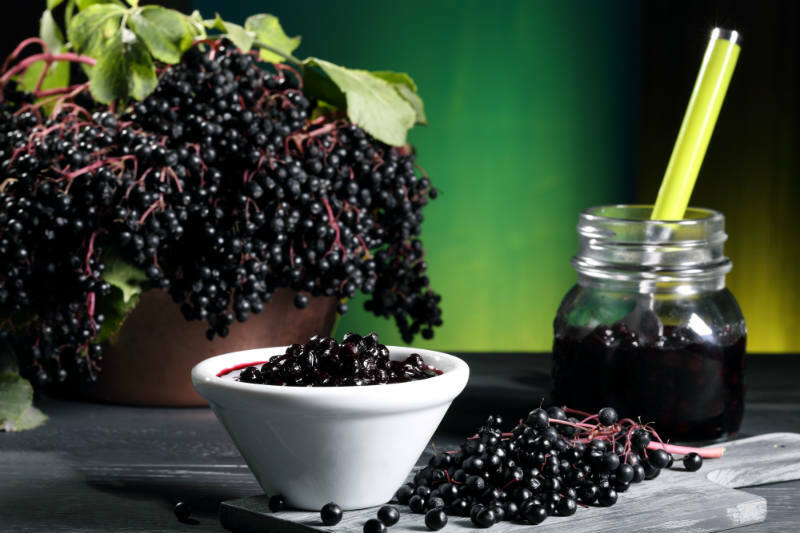 Dwarf elder preparations have shown anti-neoplastic, anti-inflammatory and antimicrobial properties, anti-cancer, anti-ulcerogenic and antioxidant activities. In addition, this medicinal plant has been used for a long time for treating inflammation-related gastrointestinal disorders, lung and kidney diseases, infections, fever, influenza and rheumatoid arthritis, as well as of wounds, insect and snake bites. Also it helps with colds and flu because contains a lot of vitamin C. It has diuretic effect and lowers the high blood pressure without side effects on the heart. In fact, the recipe is quite simple. The fruits of dwarf elder must be picked only when they are completely ripe. Then they have a distinctive dark black color and characteristic odor. Caution is needed because the green berries are poisonous. One of the side effects that might happen, when you are consuming dwarf elder, is nausea, dizziness or headache. But this is only a small element for rescue of any type of this fatal disease. The ripe berries must be well washed before they are arranged in a jar, and covered with layer of sugar. Repeat this until the jar is full. The last layer of sugar should be thicker. The jar must be covered with gauze to be able to “breathe”. It should be kept in the dark place and strained after 40 days. The last few days the content should be mixed with a wooden spoon to dissolve the sugar nicely. After you are done with the preparation of this unique recipe, you can start taking one teaspoon in the morning, 10 minutes before every breakfast. It’s good if your stomach is completely empty. The effect of dwarf elder is greater and faster if you do not eat late at night, your last meal should be at 6 pm. The herb has saved thousands of people from certain death. It can be taken with other pills prescribed by your doctor. Many healthy people are also consuming this recipe because it strengthens the immune system and thus prevents from cancer. This recipe is not recommended for women that are pregnant because there is a risk of spontaneous abortion or birth defects. Gastrointestinal discomforts have been reported in pregnant women that consumed dwarf elder. Caution! Consult a healthcare provider immediately if you experience any side effects.